Lowest Prices for the best trailer spindles from Redline. 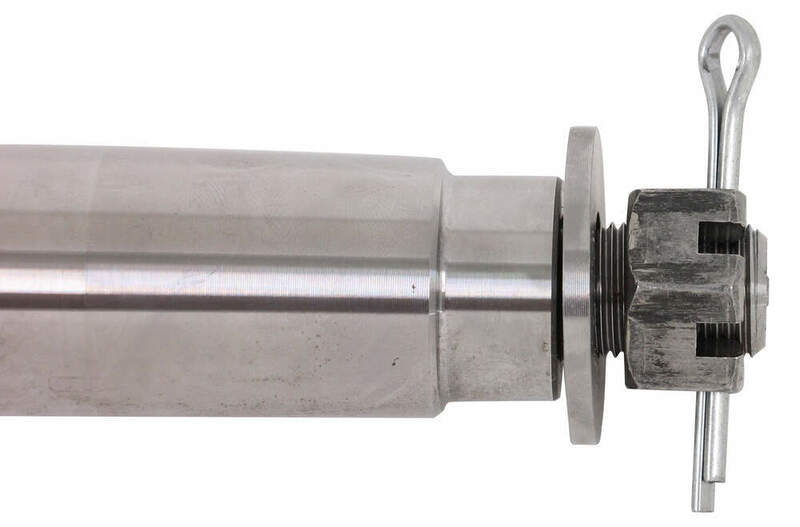 Agricultural Spindle, 1-3/4" x 5" Stub, 3K part number AS3000F can be ordered online at etrailer.com or call 800-298-8924 for expert service. Agricultural Trailer Spindle comes complete with nut and washer. 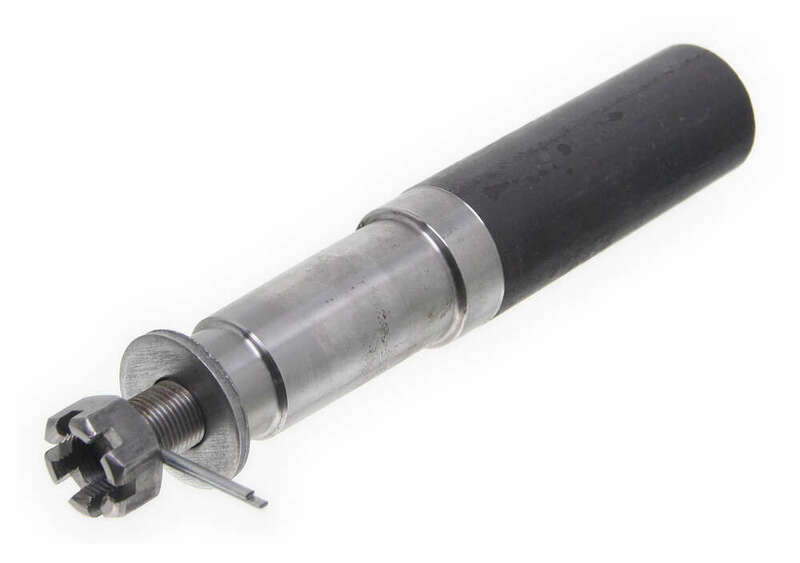 Overall length of spindle: 10"
Today we're going to be taking a look at part number AS3000F. This is Redline's Agricultural Spindle. It's going to offer a capacity of 3,000 pounds. You can see what all it comes with here, I have it all lay down on our table. You're going to get a washer, the cutter pin, the castle nut, and a spindle. All three of these parts right here are going to be used to hold the hub assembly on to the spindle. Bearings and seals are going to be sold separately but we're going to go over some measurements that will assist you in choosing the correct bearings and seals. You can see that this is a round spindle, again, it's going to have the 3,000 pound capacity. If we take a measurement of the stub length, it's going to give us a measurement of 5". The overall length, measuring from edge to edge is going to measure right at 10". Next measurements that I'm going to go over, these are measures in hundredths 00:01:10 of an inch. We're going to be using a digital caliper to get our exact readings. First one's going to be the stub diameter. This portion back here, that's going to be 1.75. The next one's going to be the grease seal. That's going to be 1.75 as well. The next one's going to be inner bearing surface. It's going to be 1.5. next one's going to be the outer bearing surface. It's going to be 1.25 and then the next one is going to be the threaded portion. That's going to be .75, which would also be 3/4 of an inch. That's going to do it for today's review of part number AS3000F. This is Redline's Agricultural Spindle. 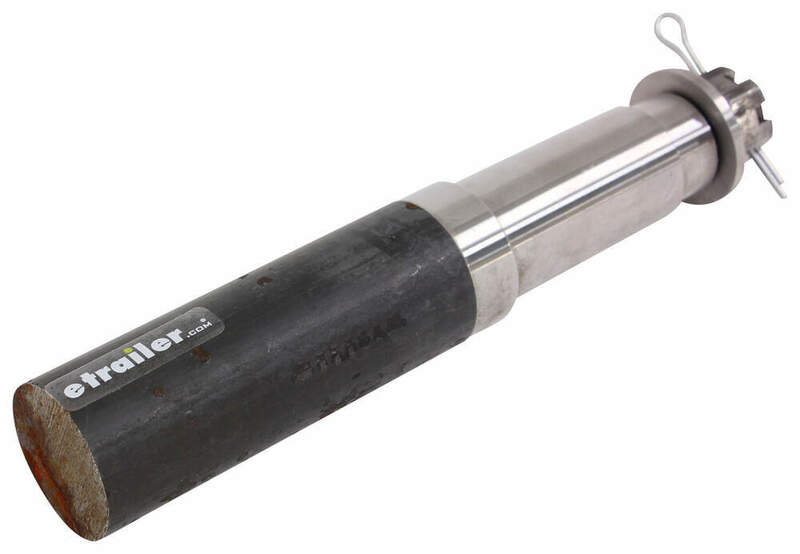 Do you have a question about this Trailer Spindle? I wish we did, but we do not carry any 10k rated trailer spindles. The highest we have is a 6k spindle like part # AS3000F. This is an agricultural spindle that could work well on your hay wagon as long as you didn't need more than a 6k capacity. Otherwise we do carry 10k rated hubs, (see link to the right), if you can find the spindles elsewhere. Although the outer bearing of the # AKIHUB-655-6-K hub assembly will fit, the inner bearing will be too large. Instead, you'll need the Complete Agricultural Hub Assembly, # AH30660FCOMP, which is designed to fit the agricultural spindle # AS3000F. I've attached a couple of review videos for you to check out. For a spindle that fits the hub part # 8-213-5UC1 you'd want the part # 52655IEU which comes with the 5,200 lb hub you mentioned and the correct matching spindle for you to install. The hub you mentioned will not fit the agricultural spindle you mentioned due to the difference in seal dimensions. In all honesty it really just boils down to how they were manufactured and what bearings and grease seal are typically found on those axles/spindles. It also may have to do with the part # R50642 being a standard application while the part # AS3000F is geared more towards agricultural applications. Either way, Redline has tested and approved these spindles for the capacities that you references. The only capacities we have for the two spindles you mentioned is the capacity of them if they are used as they are intended on a trailer axle. The part # AS3000F is for a 6,000 lb axle so it has a 3,000 lb capacity and the # R50642 is intended for a 5,000 lb axle so it has a 2,500 lb capacity. 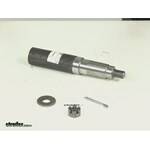 We do not carry a AS6000F spindle. We do carry the # AS3000F which may be what you meant to type. I attached a pic of it's dimensions. The spindle you mentioned has a 5,000 lb axle rating so it would not be the correct spindle. We do carry a 6k spindle but it's for agricultural hubs and isn't the correct measurements you need. It's part # AS3000F. The hub you mentioned part # AKIHUB-655-6-K is a 6k hub though so it would work well. Highest quality trailer spindles for the best price. Most detailed, accurate trailer spindle information available.